Beautifully decorated home with hot tub and forest views. A charming, classic mountain cabin nestled up against the pine forest makes for an excellent vacation spot. The first level of this delightful cabin features the living room, dining area, kitchen, two bedrooms and a full bath. The kitchen, dining area, and living room are open to each other, creating nice movement throughout the first floor. The living room is centered around a beautifully designed wood burning rock fire place. Step through glass doors to the large and spacious deck. Enjoy the wall of thick mountain forest that creates a setting so serene you will feel that there is no one else around for miles. A traditional redwood hot tub is mounted flush with the deck, allowing easier access and mellow soaking. The first floor has two bedrooms, one with queen bed and the other has two singles and a full bath. Upstairs you will find the master suite. This room has a lovely king size bed, a private bath and balcony with a stunning tree top view. Carnelian Bay Beach and Patton Beach are just a few minutes away, and a short drive to Kings Beach or Tahoe City. 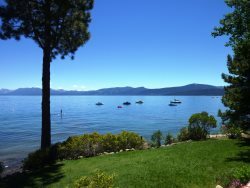 Guests at this home have access to North Tahoe Regional Park and Recreation Area which is only a 10 minute drive from the house. Cross-country skiing, sledding, tennis, playground, free disc golf, concerts & movies in the park (summer), and BBQ's. Please be considerate, this is a smoke and pet free home. Thank you for allowing us to spend a wonderful get together at your beautiful Tahoe cottage - everything was perfect and the neighbors were very welcoming too. We hope to return again , thank you . Dancing Bear is a perfect Tahoe home , exactly what the traditional lake house should be, perfect for snow and lakeside vacations, we had a wonderful stay and look forward to our next visit, thank you ! Lovely cottage, we hope to revisit- Thank you!